"I was raised off the land following my ancestor's ways. 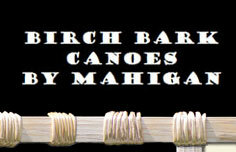 The Birch Bark Canoe is one of the gifts my ancestors shared with yours over 400 years ago." Marcel will go to your school to speak to your students about his Metis way of life. He shares childhood stories and events about growing up in the forest of Northern Ontario. His demonstration includes a full size traditional birch bark canoe that was commissioned by the Ontario Arts Council. He also brings and demonstrates all the materials and tools used in the construction process. Upon request Marcel can precut bark in the shape of miniature canoes and trim roots which the students assemble into a mini canoe. Everyone gets to take a mini canoe home with them. It is a great pleasure to share my story with you and your students. Being Metis, about half my way of thinking is from an Aboriginal perspective. My goal is to demonstrate to your students how important it is to listen, learn and observe whatever the subject. When looking for someone to teach me how to build birch bark canoes the traditional way, it was impossible for me to find anyone. Unfortunately it is a dying art. My way of life on the trap line allowed me to know a lot about where the material could be found. In day dreaming, sleeping over it, many of my childhood memories came back. I remembered as a child helping grandpa repairing canoes. Pealing birch bark to make a moose call. Digging out roots to tie poles together. Using spruce gum to patch leaky containers. The information I had gathered over a life time included knowledge from my ancestors. Although I could not find a living soul to show me how, by listening to elders’ stories, smelling the wood in order to identify it, feeling it, learning about how and when bark is peeled, roots and wood can be used: I accomplished my dream of regaining that part of my culture. I build beautiful pieces of aboriginal art. You can feel them. If you listen closely, it’ll talk to you. This is what I want to leave to your students. Learn everything you can. Absorb like a sponge. Pay attention. You will need it some day. Workshop at the 2009 Canadian Aboriginal Festival. Geographic location of traditional land. History on traditional use of birch tree. Description of materials needed, harvesting.